The name Antarctica was originally used over 2,000 years ago – well before any human discovery of Antarctica. The idea that Earth was a sphere was accepted by many of the “thinkers” of this time. One of these “thinkers,” Aristotle, postulated that a great land mass had to exist in the southern hemisphere in order to balance all the land in the northern hemisphere. He called this southern land mass “Anti-Arctos,” the counterpart to Arctos (the prominent constellation of the northern hemisphere – the Great Bear). The continent of Antarctica remained a mystery until 1821 when the Antarctic Peninsula was first sighted by either an American (Palmer), an Englishman (Bransfield), or a Russian (Bellingshausen) – there is still debate. Many of the outlying islands were known since the 1700s but, it was not until February of 1821 that the first men are known to have set foot on the continent of Antarctica. This southern cap of our planet contains 70% of the freshwater and 90% of the ice on Earth. This white continent is the home of the most violent weather on Earth and is the driest, highest, windiest, and coldest of all the continents. There are no hotels or regular air service to Antarctica. Most of the Antarctic winter (June, July) is spent in total darkness (yes, that is 24 hours), with howling winds and storms. There is no personal contact with the outside world during winter except by email, phone, or fax (if available). Summer, on the other hand (December, January) has constant daylight and many (but not all) of the storms subside. 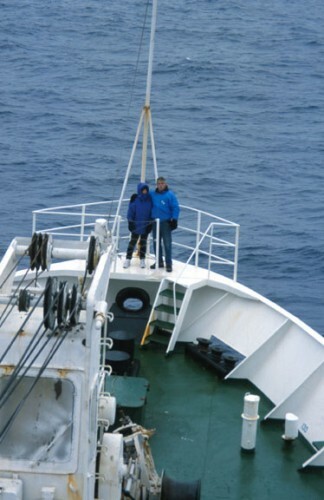 Large ice-tolerant vessels do travel to Antarctica during summer months, bringing scientists, support personnel and tourists. Since there are no hotels on Antarctica, all tourists must stay on the vessels that bring them. Many countries have scientific research stations that are homes for the scientists and support personnel. Ushuaia, Argentina, at 54 degrees 46 minutes south latitude, is claimed by the Argentineans as the southernmost city on Earth. This is where the Andes Mountains (that run in a north/south direction along Chile) turn and run east (for just a short distance) at the end of the range. Ushuaia is on the south side of the Andes, is the capitol of the province of Tierra del Fuego in Argentina, and is renowned for its cross-country skiing. It is 150 km from Ushuaia to Cape Horn (the southernmost tip of South America) and 4,000 km to the South Pole. There were only about 7,000 people in Ushuaia in the early 1990s but by the year 2000 there were over 45,000 due to a governmental promotion to revitalize this area (high wages and no taxes). With a new airport and deep water port, Ushuaia has become the major city for Antarctic departures of the large ice breaker vessels that travel to and from Antarctica. The Las Eclaires Lighthouse, an unmanned lighthouse, remains as a historical landmark in the Beagle Channel and an aid to navigation. Most large vessels must be escorted through the Beagle Channel by an Argintinean “pilot boat” as they come and go from Ushuaia. Looking east toward the end of the Beagle Channel, the Atlantic Ocean looms ahead and the dreaded rough Drake Passage. The city of Ushuaia looks south, across the Beagle Channel. It was in the mid 1800s that Charles Darwin sailed through here in the now famous vessel, the Beagle (after which this channel is named). Leaving Ushuaia by way of the Beagle Channel the real crossing begins when the vessel enters the Atlantic Ocean, and passes Cape Horn. 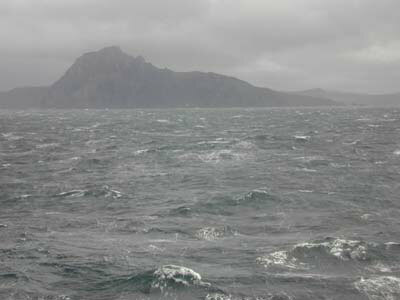 Cape Horn on an unusually calm day (December 28, 2000). We are within two miles of the Cape. Many of the early explorers lost their lives here at Cape Horn as they attempted to get from the Atlantic Ocean to the Pacific Ocean. There are numerous tales of fighting the wild seas at Cape Horn for days, weeks and even months and still being unable to round the Cape. It is an unusual day that one can venture close to the Cape. The first way is the outline of the continental land mass and its permanent ice. The second is to use the Antarctic Circle (at latitude 66.5 degrees south) and consider everything south of that latitude to be Antarctica. The third way is perhaps the best for considering the entire Antarctic as an ecosystem – this is to use the Antarctic Convergence as the defining line. The Antarctic Convergence occurs in the ocean surrounding Antarctica and is where very cold (low salinity) Antarctic water, flowing away from the continent and constantly cooled by the ice on the continent, meets with the southernmost parts of the Pacific, Atlantic, and Indian Oceans. The Antarctic water is denser, because it is so cold, and sinks, creeping north across the ocean bottoms. South of this convergence not only is the ocean water colder but the air is distinctly colder and drier than north of the convergence. Most of the life forms found in Antarctica depend on the ocean within the Antarctic Convergence so using this as a definition for Antarctica encompasses the entire physical area that is important for the complex ecosystem that is found there. The convergence moves north during the Antarctic winter, and south in the Antarctic summer – in response to the freezing and thawing of the sea ice. This Convergence is a biological barrier to organisms both in the ocean and the air because of the big temperature difference. As the driest continent, Antarctica is actually a place of low precipitation (rain, snow) but intense cold. In general, the air is much colder than the ocean water. The ocean water is usually between a +5 and -2 degrees Centigrade but the air may be well below -2 degrees Centigrade. It is like a desert (in the sense that there is little precipitation) however; any precipitation that does fall rarely melts and adds to the polar ice cap. The south polar ice cap gets only 2 inches of precipitation each year (this is more than some deserts get). The accumulated ice never melts, is over 15,000 feet thick in some areas, and depresses the continental land mass under its weight (over 2,000 feet in some areas). The bottom of this ice pack may be over 100,000 years old and holds a record (layer by layer) of the history of earth with each layer. As layers of frozen snow and ice crystals build up (above) (from any moisture in the air), the pressure from the cap pushes out toward the ocean, squeezing the ice between a few of the tall mountains that still protrude. In many areas this ice movement is much like a river (although in slow motion as flowing ice rather than flowing water) and called a glacier. 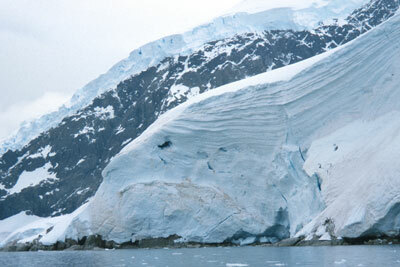 Usually the glaciers meet the ocean as tidewater glaciers or as ice shelves. Although over 98 percent of the continent of Antarctica is covered in ice there are a few areas without ice (some unique dry valleys where there has been no precipitation for 2 million years, and along some of the coastlines during the summer melt). 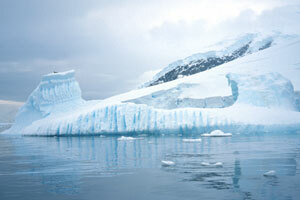 If all the ice in Antarctica were to melt, the oceans would rise 200 feet!! As a result, the continent of Antarctica would rebound (rise) without the weight of the ice and the world would be a very different place. The presence of all the permanent ice in Antarctica makes it the highest continent, with the average elevation at 7,100 feet and large areas in the interior over 13,000 feet. The ice sheet thins as it reaches the edges of the continent melting back during summer and exposing rocky beaches and headlands, or forming ice shelves and tidewater glaciers. In some areas of Antarctica the glaciers flow along the continent, toward the ocean in such a manner that they spread out and are relatively flat for some distance on the continent. If these glaciers are thick enough, and not subject to a lot of cracking, they may form permanent ice shelves along the edges of the continent. This is common on either side of the Antarctic Peninsula (the Ross Ice Shelf, to the west, and the Ronne Ice Shelf, to the east). The ice shelves may be grounded near the edge of the continent but are usually floating along their outer edge although the ice may be over 800 feet deep at the edge of shelf. The face of most of the permanent ice shelves is around 100 to 200 feet high. It is very difficult to get ashore along these ice shelves (although not impossible) and it may be dangerous if the shelves are cracking. Some of the largest ice shelves are so permanent that their edges actually show up as the edges of the continent (like the Ross and Ronne Ice Shelves) and some have permanent scientific outposts and/or weather stations established on them. When pieces of these ice shelves crack and break away, they may be very large and have a uniquely flat top (thus they are called table bergs). One of the largest such table berg was the size of the state of Delaware (named the B-15 iceberg, it was 185 by 23 miles) and broke away from the Ross Ice Shelf about March of 2000 changing the outline of the Antarctic continent. As the glacial ice meets the ocean it can become unstable and “calve.” This is especially common in areas that are steep and the glacial ice cracks as it flows downhill toward the ocean. These cracks and crevasses create weak areas that easily break free as the glacier hits the ocean. Calving is when large chunks of a glacier break and fall off the end of the glacier into the ocean – this creates a disturbance in the water and may result in a “mini tidal wave” along nearby beaches depending on the size of the piece of ice that has crashed into the ocean. Most of these pieces of ice are irregularly shaped as they float away from the face of the glacier. Many of the Antarctic glaciers become very unstable in the summer and one can hear a constant rumbling if you are near a tidewater glacier. It is always a good idea to be very careful if you are on a beach near a calving glacier and have a plan for getting to higher ground should a large piece of ice be calved. Ice sheets melting back and exposing old layers are often seen in the summer months along the edge of the Antarctic Peninsula. Ice floats with only about one sixth or one seventh of its mass out of the water – most of the ice is underwater – thus the saying “it is only the tip of the iceberg” meaning that there is much, much more. Icebergs melt more in the ocean water than in the air in Antarctica. You can see the melted shelf along the edge of the berg . The reason for this is that the air is generally colder than the ocean in Antarctica. 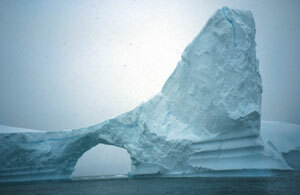 Arches often form in some icebergs as they melt. 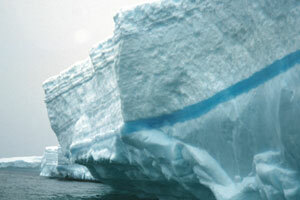 Cracks in icebergs may fill with freshwater and freeze as blue lines. 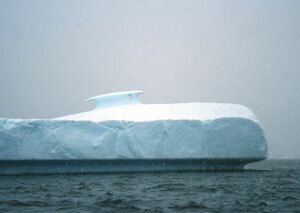 Vertical melt lines may form while the iceberg is underwater as bubbles are released while the ice melts. The bubbles rise up to the surface and create the vertical lines in the ice. 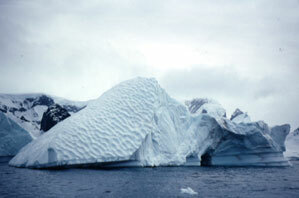 As the berg melts from below, it becomes unstable, turns over and the underwater area becomes visible. The pockets on this iceberg were formed when this side of the berg was underwater. It has turned over since these were formed. During winter the ocean freezes along the edge of the entire Antarctic continent, more than doubling its size. This sea ice is frozen saltwater and melts back each summer (some summers more than others depending on the temperature). The first area of Antarctica to be free of sea ice is the tip of the Antarctic Peninsula (directly below South America and at the other end of the Drake Passage) during late spring and early summer. There are several areas on the peninsula and nearby islands that do not have permanent glaciers so each summer these beaches become available for landing (by humans and animals in need of an ice-free place). As the sea ice breaks up each spring numerous penguins, seals, and seabirds make their way to these few available landing sites for breeding.